This 1992 music performance documentary has finally found its place on a wonderful Blu-ray. 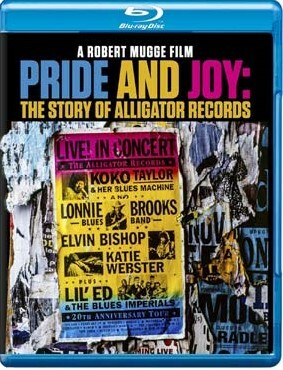 Robert Muggle’s film is a great exploration of the art form of the Blues. This is jam packed with musical performances that stand out above and beyond. This is an intense journey of the soul through music and history of this Record label. This captures the 20th Anniversary concert. With such performers as KOKO Taylor and Her Blues Machine. Lonnie Blues, Brooks Band, Elvin Bishop, Katie Webster and more bring this concert to a vibrant, one of kind experience. This is a wonderful program that in my viewpoint is a must see, must own experience. I am a huge music lover and one of those realities is the Blues, and this Blu-ray captures it perfectly. The story is in 1971 Bruce Iglauer created and founded Alligator Records. In 1992 he decided to showcase 20 years of Alligator Records by creating this concert. This film which in my viewpoint is a historical music program showcases that tour and experience. Featuring one of the greatest American singers to ever grace the music world, KOKO Taylor. KOKO was one of the finest singers and performers to ever exist. Her passion, expertise and soul came through her music. Sadly, she is no longer with us but her legacy lives on. She like all the other performers on this musical program is a shining example of how to showcase music history. Alligator Records was created as a wonderful independent label that became one of the best labels for the blues. Now you can experience this wonderful program, these amazing performers. Alligator Records was and is a pivotal part of music history. So many flawless performers came out this label. Alligator Records has given outlets to top notch performers that will always remain important because of this label. Now you can experience this one of a kind, flawless performances on this perfected Blu-ray. The audio and video is fantastic. Just being able to hear these masters in a crystal clear way through amazing audio is what it's all about. One has to experience these masters of the music world to fully understand and appreciate them. You get an additional audio bonus of 10 performances from the tour. This 87-minute film is a wonderful watch of classic music. A historical program for any music lover.